I am sure many have asked the question. As you will surely know: It is not possible to answer with anything even approaching a rough degree of certainty. However, I have been running opinion polls on the Brexit question for the last year, and have carried out 3 across June (2x before, 1x after announcement of the result). While opinion polls are far from perfect, they do still help in understanding rough trends. Below are the results of an opinion poll carried out immediately prior to the Brexit vote; followed by a poll carried out over the days immediately after. First is a straight ‘Before & After’ comparison of the 2 polls. Below that is a little greater detail on each of the polls. Additionally, there is data gathered over the last year on ‘the Brexit’ question, to add further context to the results. Note of Caution: I am not publishing this to suggest that there should be another referendum. I am simply publishing as I have been tracking this for the last year, and found the massive change in results very interesting. 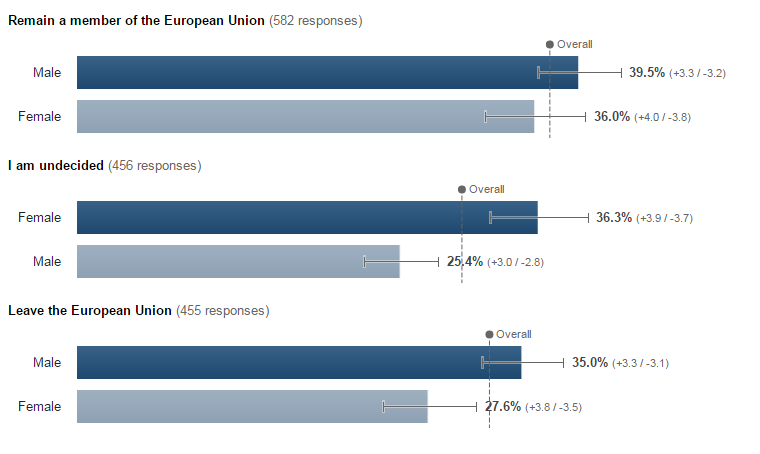 Summary: The poll results show a big shift from the ‘Undecided’ group to the ‘Remain’ group. 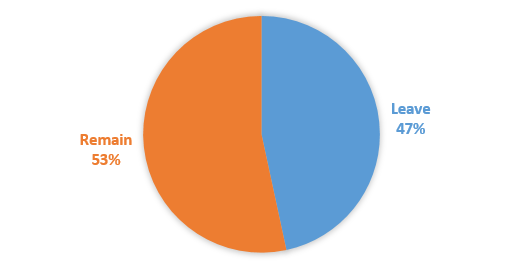 The size of the ‘Leave’ group changes, but only by 4-5% points. Each poll here was anonymous, carried out among adults in the UK, via the internet. There were 2,018 responses gathered in the ‘before’ poll. There were & 1,092 responses to the ‘after’ poll. The data is weighted based on the internet population of the UK, and that weighting is based on demographic data from 1,485 respondents in the ‘before’ poll, and 829 respondents in the ‘after’ poll. The ‘undecided’ group is quite high. This was a UK-wide poll, with no filter question clarifying whether respondents were registered to vote. Ie, it is representative of adults in the UK, not just voters. Importantly: ‘Remain’ polled at 37.2%, the ‘Leave’ answer polled at 32.5%. You can see from the bars that each had a margin of error of +2.6/-2.5. Ie, the ‘Remain’ result was predicted between 34.7 and 39.8; the ‘Leave’ result predicted between 30.0% and 35.1%. Ie – according to the snapshot poll – ‘Remain’ would probably win, but there was a chance ‘Leave’ would prevail. ‘Leave’ has dropped, but only by 4 or 5 percentage points. The ‘undecided’ group has dropped hugely – from 30% to 15%. Based purely on this poll, those believing the UK should remain a member of the EU outnumbered those who believe we should leave the EU by a margin of 2:1 after the referendum result was announced & newspaper headlines and politicians had responded to the result. Below is a summary of most of the Brexit polls I have carried out over the last year, to add context, and further illustrate the large change in results. Most were carried out among just over 2,000 respondents; one or two were carried out with just over 1,000 respondents. The early polls I chose to omit the ‘Undecided’ group. The referendum question changed late last year, from a ‘Yes/No’ question to ‘Remain/Leave’. Among these polls, there is a large swing from ‘Undecided’ to ‘Remain’ following the announcement of the results. 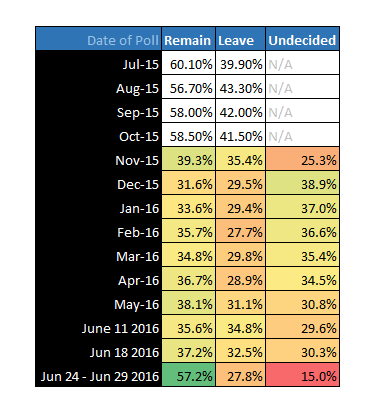 The ‘Leave’ group has dropped, but had polled at similar levels previously. The ‘Undecided’ group has dropped significantly. Above are simply opinion polls. As we all know, opinion polls do not necessarily predict the actual result of elections or referendums, they simply offer a snapshot of opinion among a group of respondents. The respondents above were in the UK, but not necessarily registered to vote. Data was gathered anonymously, asking the referendum question, and is summarised weighted against the internet population of the UK. Excluding ‘Undecided’, 53.4% prefer ‘Remain’ while 46.6% prefer ‘Leave’. Men were slightly more likely to answer ‘Remain’ than women; paradoxically men were also more likely to answer ‘Leave’ than women. Men were much more likely to give an answer one way or the other, whereas a higher percentage of women answered ‘Undecided’. Age is a strong predictor of response. 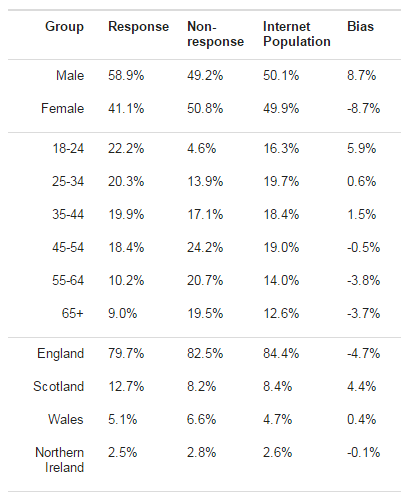 18-24 year olds were most likely to answer ‘Remain’; 65+ year olds were more likely to answer ‘Leave’. The poll ran & as displayed to a random sample of users within the UK. The question was worded as per the official question. There are lots of caveats with data such as this. It is a ‘snapshot’ rather than a ‘prediction’. I have asked the specific ballot question, rather than framing it as “If you were to vote today…?”. I’ve left error bars on the results so that you can see the variability. I included a series of caveats & additional notes on a previous similar poll I ran. You can read those in the ‘caveats’ section of this post.